Cobblers trio Junior Morias, Jordan Turnbull and Shaun McWilliams could all be available for selection this weekend after recovering from their various injury problems. McWilliams overcame a hamstring issue to make his first start since mid-February when playing 55 minutes against Port Vale on Saturday but manager Keith Curle has since revealed the midfielder suffered a minor reaction. He should be fit enough to be considered for selection when the Cobblers head to Notts County on Saturday though, and the same applies to midfielder Jordan Turnbull and striker Junior Morias. 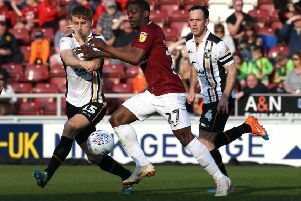 Morias has been working his way back to fitness following an appendix operation while Turnbull sustained an ankle injury following Northampton’s 0-0 draw against Grimsby Town last month. There was also encouraging news for young Brighton loanee George Cox who has not played since January following ankle ligament damage picked up during the 3-2 defeat at Cambridge United. “We’re hoping George will join us later on this week,” said Curle. “He’s back to his field-based rehabilitation and I think he set the target himself of being back involved for the Notts County game, but it might be three or four days too soon. “Junior is also back on the field and joined in with the squad for the first time on Monday so he’ll be trying to put himself in contention for selection on Saturday. “Jordan Turnbull is reacting positive after going on to a course of injections for his ankle and that’s responding very well.